EPJ's Bob English has recently commented on the role informal, off-the-record meetings between bankers and their regulators play in enhancing the lucre of their business models. And EPJ mastermind Bob Wenzel has also been tracking the way in which the new Dodd-Frank bill will create 122 new power centers in the federal government, power centers which have the task of creating their own rules and means of enforcement with heavy influence from lobbyists hired by the very firms that are meant to be regulated by the bill. Along those lines, I came across a few quotes from (at the time president of FRBNY) Tim Geithner and former president of FRBNY Bill McDonough in my recent reading of Superclass which I found to be revealing. I reproduce them now in full below for your own perusal and consideration. Recalling a situation in which he had to manage a crisis in the derivatives market, he said, "What we did is, we got the fourteen major firms in a room down the hall here with their primary supervisors, a group of the largest global institutions and their supervisors from five countries. And we said to them, 'You guys have got to fix this problem. Tell us how you are going to fix it and we will work out some basic regime to make sure there are no free riders to give you comfort, so you know that if you move individually everybody else will move with you.' And there is nothing written, no guidance, no regulation, no formal process. We did it without a formal request to us. We told everybody we were going to do it but we were not asked to do it." "These fourteen firms," he continued, " accounted for something like 95 percent of all the activity in this market. The Fed, the SEC, the FSA, the Swiss, and the Germans were there. And those were the principals, and each firm brought three people, they had an executive committee of four firms that ran, almost weekly at the beginning, a conference call among the other firms. And the best thing about the process was that it was efficient, there was nothing written except letters from the firms laying out their commitments. There's no formal mechanism we could have used to force this on anybody so we had to invent it. I think the premise going forward is that you have to have a borderless, collaborative process. It does not mean it has to be universal, every jurisdiction or every institution. It just needs a critical mass of the right players. It is a much more concentrated world. If you focus on the limited number of the ten to twenty large institutions that have some global reach, then you can do a lot. It's interesting, actually. Of the fourteen big firms... [chairman and CEO of Goldman Sachs] Lloyd Blankfein jokingly called them 'the fourteen families,' like in The Godfather... The Japanese were not in it, which was interesting. It is really the Swiss, Germans, U.S., U.K. Really mostly the U.S. and Europe. No Asian firms." It should be obvious what kind of bold-emphasis I would've added throughout those paragraphs so I won't bother. "There is a growing view," he remarked to me, "that the modern economy is benefiting the more successful at the expense of the less fortunate. In the United States, the lower half of income distribution has not been keeping up." "I believe that in all societies, clearly in democracies where the electorate can change the government at the next election, more attention has to be paid to making it clear to all the people that they too can benefit, or at least that the educational system gives their children that opportunity. That is the American dream. But even in less democratic societies, governments govern over the longer term with the consent of the governed. If not, revolutions take place." "In guiding globalization, government leaders, central bankers, and leaders of the business community simply have to do a better job of taking those actions needed to have all the people believe that the system benefits all." Note that among other devious insinuations, this confidence man expounds on the importance of spreading faith in the system. And never mind the fact of a man who is now a vice chairman for a company he once regulated, on the eve of its undoing (2007). Who is the intended audience of this book? Certainly not the global elites that it purports to be about-- they are too busy running the world to read a shallow book about how they're running the world. Not the poor and the weak, which this book laments often for not having enough of a voice in l'affairs du monde. Besides, such people are too broke and overworked to afford the time and the money necessary to trudge through such an "erudite" work. No, this book was written for the rubes, and not just any rubes, but the self-styled informed, politically knowledgeable rubes. This book was written for the rubes who make the whole system of global governance (Rothkopf's favored phraseology, over the alternative of global government) by an amorphous band of interconnected global elite, the titular Superclass, possible, simply by blinding themselves to the reality of the scam being pulled on them. Rothkopf has written a book for the rubes who diligently go out every election and vote Democrat or Republican. He has written a book for the rubes who read the papers, watch the news and occasionally complain about the state of the union within the comfort-zone of like-minded friends, the people who willfully believe the best of intentions for their leaders who sometimes err from the path of pure nobility. In other words, Rothkopf has written a book for the people who take the game of thievery called "politics" seriously because mere consideration of the alternative, that is, the reality that it's a mechanism for knavery, is absolutely terrifying to them. The author himself is as clueless as he is totally interconnected with the elites he intends to observe, and therefore he is compromised. On economics, the book reads like an especially amateurish Newsweek or Time magazine article-- the fall of the Berlin Wall and the USSR has demonstrated the failure of communist and Marxist ideology, but the rise of the "free market" in their wake has brought with it its own set of problems and inefficiencies, namely a growing gap between the haves and have-nots which threatens social instability... a constantly trotted out meme about the "free market" that is ten times more applicable to actual communist regimes throughout history, as well as their various feudal historical counter-parts. The solution? Why, a compromise, of course! An enlightened middle-ground between welfare and profit-seeking that leaves no man behind, the precise admixture of which shall be derived and administered by our honest and earnest, all-seeing elites. On politics, conspiracy and corruption it is even worse. Rothkopf spends multiple chapters clearly and unabashedly explaining just how interconnected the global, superclass elite of the business, political and military castes are, the three main social castes which are increasingly blending into one and the same thanks to lobbying and revolving-door retirement arrangements and interlocking corporate directorships. Then, Rothkopf introduces the "fringe" viewpoints of internet crazies who insist there is a global elite pushing for one world government and he quickly dismisses these people as outrageous and pathetic individuals with overactive imaginations and paranoia issues. What explains the seeming disconnect? Easy! As mentioned earlier, the machinations Rothkopf himself observes are examples of benign, even benevolent and definitely necessary steps toward establishing global governance, while the conspiracy theories of the loonies represent sinister attempts to grab at an anti-social power and control at which no one he is friends with has ever admitted to aiming. Rothkopf's viewpoint is firmly rooted in the post-World War II establishment mindset, which has since the end of that conflict sought endlessly for a solution to ending the competition of various national sovereignties on the global stage without resorting to out-and-out global government itself. And if, in their quest to help the world to "live as one" these global elites occasionally get rich from their special connections and behind-closed-doors wheeling and dealing, or even do something verging on the tyrannical and arbitrary, how might the good sheeple appropriately respond? Says Rothkopf, don't worry, trust harder. But how do we know we can trust these people to not abuse their power and privilege? Because they told me so, says Rothkopf. Why would they lie? Indeed, that's a question Rothkopf doesn't spend any time pondering. Rothkopf is the dictionary definition of credulous. He starts from the premise that the global elites are a force for social harmony and then uses that premise to prove his belief that the global elites are a force for social harmony. The book is a series of conversations with people covered in chocolate and cookie crumbs repeating, over and over, "I don't even LIKE chocolate chip cookies! ", to which Rothkopf smiles and says, "Hey, sounds good enough for me, I'm just happy to be invited to the World Chocolate Chip Cookie-Stealers Forum." The section on the Internet, replete with an explanation of how it has allowed various people who doubt the inherent goodness of the global elite to find each other and communicate their fears in a public manner when they otherwise would've been unheard worriers in the hinterlands, was a major tell. For a faithful tool bent on elite apologia trying to assure the rubes that everything is okay and the elites will take good care of everybody if we just let them, Rothkopf's insistence on this point seemed to hint in a not so subtle manner that the unregulated speech of the Internet is worrisome to these people and their planning efforts. Combine this with his ignorant citing of search result statistics as if this is somehow scientific and indicative of social trends informing the zeitgeist and I am left to seriously question whether Rothkopf even knows how to check his own e-mail. I give it 1/5. Concerning the Superclass, the book's message could be best summarized by the phrase, "Nothing to see here, folks, move along." Once left for dead, shares of bailed-out American International Group Inc. have defied critics and rallied to become one of the market's top performers in 2010. On Tuesday, AIG's publicly traded shares closed 45 cents lower at $58.93, capping a nearly 97% gain in the year to date and over 42% in December alone. The insurer is the fourth-best performer in the S&P 500 index this year. The holiday season has been a productive one for me this year in terms of barreling through some reading I wanted to do. The latest casualty of my war on unread books was The Science of Success: How Market-Based Management Built the World's Largest Private Company, by billionaire Charles Koch, CEO of Koch Industries. I've read a number of management books at this point in my life and so I want to say up front that I typically find them to be boring, clichéd and overly-general to the point of being almost worthless. It's led me to wonder if good management isn't more of an art than a science. But, I figured it isn't often you have the chance to read management strategy from a guy who employs about 80,000 people and is a personal billionaire himself, so I decided to give The Science of Success a shot. First, the bad: this is definitely a management book. It wasn't exactly thrilling to read, it's filled with quotes and cliches (aka "Other People's Wisdom") and it manages to be pretty general. The book isn't a complete failure, however. While it wasn't thrilling, it wasn't pass-out-on-the-couch-head-tilted-back-90-degrees boring, either. The quotes that were picked were well chosen, relevant and at times inspirational. My favorite was the elder Fred Koch advising his son, the author, upon joining the family business, "I hope your first deal is a loser, otherwise you'll think you're a lot smarter than you are." Consider me sufficiently humbled at this point, to the point that a bit of success would be a most welcome surprise! As for the generality, Koch at least tried to provide specific examples of the principles being applied in his business here and there. Overall, the book falls short of true value. Charles Koch is no idiot and I don't think that my lack of enthusiasm for his book says anything about his business acumen. I just think there's more to how he runs his company than what he provides in this short summary of Market-Based Management principles. I give it a 3/5. Political without being polemical, built on a sound foundation of free market economic theory, it still has trouble overcoming the tendency toward painting with broad strokes on a small canvas. I got the most out of Chapter 7, Incentives. Somewhere better to go for management principles? You may be wondering where, if not in the management principles book of a billionaire, one might find the most instructive lessons on sound management? Believe it or not, I suggest history books. They hold the totality of human experience and at some point you will encounter nearly every management virtue and folly ever made, for human nature is both timeless and unchanging. Consider the multiplicity of lessons taught by just one brief, paraphrased example from a chapter on the Egyptian pharoahs in Will Durant's Our Oriental Heritage--Ikhnaton, a pharaoh of the 18th Dynasty of Egypt, decided to change the religious culture of Egypt from a polytheistic tradition to a monotheistic one, built a brand new capital city and attempted to remove references to past gods and traditions from official records. In so doing, he offended nearly the entire class of the wealthy, powerful and influential Egyptian priesthood who had built their public reputation on the polytheistic tradition. Additionally, he offended many common Egyptians who loved and revered his father, the previous pharaoh, and the old traditions he had strengthened, when Ikhnaton attempted to wipe his father and his father's influence from monuments and records. Finally, he ruined many businesses and merchants when he shifted the center of commercial activity to his new capital city. Suffice it to say, Ikhnaton proved unpopular over time and when he died, the priesthood made a concerted and successful effort to return the country to the old ways, in turn erasing Ikhnaton and his achievements from monuments, records and the collective memory. Can you see some lessons here in managing people, reforming and implementing change in large social organizations and dealing with the incentives of entrenched, entitled special interest groups? I queried a few young Chinese for their thoughts on a recent Business Insider slideshow about the Ghost Cities of China. Below I reproduce their brief, e-mailed thoughts, unedited. This is not meant to be scientific, thorough or necessarily indicative of anything other than these individuals' opinions and perceptions of this issue and those related. I still believe it proves interesting. I always think that the real estate is a bubble, people just keep investing and hoping the price to go up, fake value. But about the first link, I don't really believe that, I've been to many cities in China, even some of the ones mentioned in the news, but I never see the emptiness like that. And the way a Chinese city develop is that the government will decide which area will become the next new district, then they will direct the business to that direction. Sometimes it takes years for an area to become the new district - probably that is what this news(1st one) is talking about...? if ur asking my opinion id say these are probably not real. there is no such place in china with perfect living condition with out human. chinese are everywhere, i highly doubt the government could do this with anybody known about it. realty business in china is a very hot topic. basically u can make lots of money by buying lands at a low price and selling the houses/buildings/apartments at much higher prices. thats what they thought about it, theoretically. but the truth is people who need to buy a house doesnt have money(enough money) to buy it. but there always are richmen buying properties like crazy, they think the price is not gonna go down so its a zero risk investment. in genenral, ppl who needs the house cant afford it and ppl whos actually buying them they dont need to live in them. thats why lots of new buildings are empty. it happened before in hainan we call that property bubble. but at that time ppl were not interested and all the buildings in sanya were empty. u can tell what happens right now its quite similar. chinese government is about to rise a new decree about house duty on the purpose of lower the housing price. it might work, but it rises new problems as well. i cant predict what will happen, but i think the essential problem is that, there are TOO MANY PEOPLE HERE!!!!!!! and we are all VERY POOR!!!!! there are so many misunderstandings about china, but even we're chinese, sometimes we dont know what the hell is going on. but the inflation here is definitely worse than the government anouced it would be. chinese are buying like crazy but i dont think its because we're rich its because the money we're holding is devaluing better we change it in to goods. I am waiting on responses from a few other individuals. This post may be updated later if I hear back from them. They are very interesting sensational news articles, indicated in the choice of words as "Amazing" and "Ghost". It seems that the authors use satellite images embedded with a strong technocratic rational to establish the authenticity of their bold claims. The general public who are not aware of the facts in China may easily buy into these claims, however, for Chinese audience, they may easily detect the flaws in the arguments. For example, the caption for one image says "No cars in the city except for approximately 100 clustered around the government headquarters." To my knowledge, it could not be an evidence for the claim of "ghost city", since the majority of people in China still don't have their private cars and the primary transportation is public transportation system. Also, I'm not sure about the accuracy of all the statistics. However, I agree that satellite images do present many meaningful messages regarding cities' construction. In order to convincingly argue for this certain interpretation, as a reader, I expect more recourses from different angles. Skepticism is a common theme, it seems. During my holiday vacation this year I came across a neglected copy of Robert Kiyosaki's Rich Dad, Poor Dad. Having a bit of free time on my hand, a burning curiosity to see what was inside of this short and popular book and with nothing better to do I sat down for a few hours and read it. I see now why the book has been so popular-- the advice contained within is sensible and sound enough to be of value to many people, while the story and the book themselves which are wrapped around these few principles are so lacking in technical detail or substance that they are still appealing to the simplistic mental faculties of your average American drone. That's really the heart of it. Kiyosaki is no story-teller, and he may not even be much of a businessman in real life. It seems as if an awful lot of his financial success has come from self-promotion, the timeless strategy of "fakin' it 'til you make it!" come to life. Kiyosaki's decision to share many of his principles in the form of stories and dialog from his (eight-year-old) childhood are trite and uninteresting. The narrative lacks authenticity when much of what is being recounted has obviously been concocted with a heavy-handed dose of artistic license. And it's apparently come to light somewhat recently that Kiyosaki admits his "Rich Dad" never actually existed. But the few principles sprinkled throughout the book are worthwhile and likely extremely helpful for the many who would otherwise be totally clueless about their personal financial affairs. Kiyosaki's biggest pitch, you must produce before you can spend, and you should always do so in a sustainable fashion, rings loudest today in light of current economic catastrophes. But that doesn't compensate for the book being overly long. If you want to know what it's about without actually reading it, try this WikiSummary of Rich Dad, Poor Dad. Otherwise, if you must buy it and/or read it yourself, I highly suggest skimming. You'll easily find the main concepts and ideas and be spared the plodding development. Take the big picture concepts, leave the rest and don't take any of it (or Robert Kiyosaki) too seriously. I give it a 2/5. The book peaks in the first twenty pages, when you finish it you are left with this odd feeling like something shady has happened but nonetheless it gets a few points for having some worthwhile principles to keep in mind in consideration of personal financial affairs. For the genre, I much prefer the classic The Richest Man in Babylon, a book full of true wisdom (rather than sound advice) which manages to be told in a captivating manner as well. The economy is collapsing. The Fed is stumbling toward hyperinflation. The looters on Wall Street continue their charade. The American Empire is waning. But what do Americans really care about? Senate Passes Bill To Lift Gay Military Ban, at the WSJ.com: 636 comments and climbing! This is a truly epic and important legislative event, America, one to top all of the epic and important legislative events caused by the noble, glorious leadership of Congress. Get on that link, login, sound off! Let everyone else know how deplorable it is that gays serve openly (not serve, serve openly) in the military and how being gay is a crime against god and nature, or, let everyone know how only stupid, bigoted redneck religious sheep could possibly find anything wrong with gays serving openly in the military. Whatever your viewpoint, make it known. It's imperative you voice an opinion on an issue which on its face seems rather trivial compared to everything else going on-- the future of this great nation hangs in the balance. I just finished Diary of a Very Bad Year: Confessions of an Anonymous Hedge Fund Manager by Keith Gessen of literary website n+1. A friend and fellow industry member CP has already thrown up his review of the book. His review is thoughtful and thorough so I'll try to keep mine short and not retread the same ground he has already covered. First, I thought the title and cover of the book were very misleading. 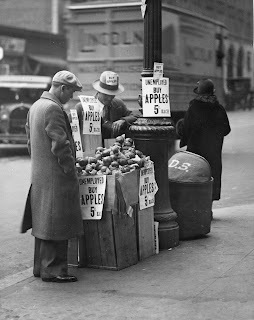 There is nothing confessionary in nature here and the "very bad year" being referenced mostly pertains to everybody else-- "HFM", the anonymous protagonist, seems to have suffered some nicks and scratches himself but he wasn't reduced to selling apples on the sidewalks of Manhattan. The book is a collection of interviews of HFM that serve merely to provide him with a medium to share his views of what happened in the financial markets, not pour out his grief about being a casualty himself. Secondly, I found the admitted economic ignorance of the author amusing (he self-identifies as a leftist, little surprise after admitting he knows nothing of economics). The author states at the beginning of the book how fascinating and impressive he finds HFM to be in terms of how his mind works and how he can explain so much about what happened in the financial markets. I found myself wondering how much more impressed the author would've been had he spoken to an Austrian-minded individual, but just as quickly realized that there's a reason why the literary catalog of post-crisis reflections is nothing but a series of concerned but ultimately clueless mainstream perspectives. Similarly, HFM's understanding of what took place was both expected and unexpected. Expected, because he concludes that the various bailouts and interventions were necessary and beneficial. Unexpected, because despite such beliefs his analysis was faintly reminiscent of Austrian Business Cycle Theory. HFM repeatedly, adamantly and correctly claimed that the financial crisis was a result of misallocations of capital and resources, that the aftermath is simply about allocating losses that actually occurred in the boom time, not preventing the realization of loss now, and that this process is essentially unavoidable if the economy is ever to get onto sound footing again. As for what caused those misallocations, HFM knows there was too much lending but he isn't sure why (Austrians blame fractional reserve banking and central bank-induced moral hazard). There are a number of good-to-great quotes in the book related to these topics and HFM himself offers additional perspective on other topics relating to the theory of finance and investing which are valuable to consider. For anyone looking for a "how-to" of the hedge fund world, or who are hoping to become better investors, this book offers very little. I thought one of HFM's best suggestions was taking a "Black Box" approach to examining poor investment decisions, though I wondered if more might be gained by carefully scrutinizing winning, rather than losing, trades. Perhaps it depends on whether you focus on margin of safety or not. Overall, the book provided the most utility by demonstrating the mainstream intellectual perspective. HFM is knowledgeable, thoughtful and obviously highly-educated, as are most of his competitors. However, this knowledge, thoughtfulness and education ultimately proves to be superficial-- HFM and his brethren are content to stop at "animal spirits" as an explanation for business cycles, they're happy to employ self-contradictory logic in their thinking about the economy (how do misallocations of resources occur in a world where aggregate demand is the ne plus ultra of economic motivation?) and they routinely miss the obvious in their apparent confusion concerning why, post-crisis, financial players seem to have such incredibly short memories of all the pain and anguish they all recently suffered through. The reason is simple, and HFM is aware of it in some other part of his mind but can not seem to connect the dots: thanks to government intervention, very few of them have yet paid the ultimate costs of their outlandish economic misbehavior. I'll use CP's 5-point scale and rate this book a 3/5. It was short, enjoyable and informative for the most part, but it didn't live up to my expectations. I'd recommend it to anyone who is curious to relive the last two years of financial crisis from the perspective of someone inside the financial industry, with the caveat that this is a slightly flawed, mainstream interpretation of those events. Move over Tea Partiers and other participants in the faux-liberty enthusiasm movement, there's a new game in town. It's called "competitive government", it's all about faux-markets and it's starting to gain interest amongst municipal governments and city managers. Case in point: I sat through a presentation on "competitive government" efforts delivered by one local city manager on the morning of December 4th and it was long on feel-good phraseology borrowed from the best and brightest within the private bureaucracy of America's largest corporations and short on any non-fatally flawed fundamental economic theory to support it. Competitive Government: What's It About? As one city's government puts it, the "competitive government" movement is about "the transformation of traditional government into a competitive service business model" which aims to achieve "high quality services at the lowest cost" while "doing more for less" and "maximizing value for our citizens' tax dollars." On its face, it sounds great! Who could be against doing more for less and maximizing value? In fact, these are such obviously desirable goals that it almost makes you wonder why, after thousands of years of experience (and experimenting) with government nobody thought of this sooner? "Competitive government" theory doesn't assume to address this fact. "Competitive government" acknowledges that government is "broken" due to special interest group lobbying, union influence and gross cost overruns, all of which contribute to city financing schemes which are generally a shambles. The solution? "Competitive government" initiatives aim at using the private market for real goods and services as a model to emulate by cutting costs, raising employee productivity, eliminating "luxury" expenditures in favor of "necessary" expenditures and fomenting a sense of respect toward the city's "customers" and a sense of urgency toward work amongst city employees. In other words, pretend government is a legitimate private business while ignoring the fact that it is not. And for any of you Randians out there who might be wondering-- you have no need to get excited because "competitive government" has nothing to do with Ayn Rand's theory of governments which would compete for tax-payer dollars. Instead of competing with other governments (as the city manager in December 4th's presentation admitted was the existing model), "competitive governments" set their sights on businesses in the private sector in an aim to compete with them on price and quality. Let's go back to that city manager presentation I was telling you about earlier. And by the way, the individual in question and the city he represents will remain nameless-- this isn't about bullying particular individuals or criticizing the particular implementation of these strategies in one city, it's about addressing the generally erroneous thinking that underlies "competitive government" theory. The city manager was stopped by some questions from the audience part-way through his slide show presentation about "changing the culture" in government, his personal push for "continuous improvement" and the adoption of "best practices" and some facts and figures on recent cost-cutting successes. "I have two questions. I've enjoyed your presentation and I find the idea of making government more open and competitive, like a business, rather than closed and monopolistic, to be an enticing one. My first question is this: will the citizens of your city be free to not pay their taxes if they don't want your services?" An uncomfortable silence came over the room. The city manager appeared to be sternly but thoughtfully considering what I was aiming at and then said, "No." "If the citizens are not free to stop subsidizing your efforts with their taxes if they don't want the services you provide, then you are still a monopoly. And if you are still a monopoly, all of what you just discussed is interesting but amounts to nothing more than flowery rhetoric." The audience, up to this point delivering a series of hoots, hollers and hurrahs every time the city manager exclaimed strongly against waste, inefficiency and taxpayer abuse (you know, the common domain of monopolistic government everywhere) was now outraged at my inquiry. Over cries of, "Let him speak!" and "We don't have time for this!" the city manager advised that "they can move if they aren't happy with their services." Ah! Randian "competitive government" at last! So, we've established that "competitive government", while interested in emulating the behavior of voluntary, private business, is not interested in actually becoming one and will still rely on the use of coercion to derive its financial resources. In other words, government will still be a monopoly, but a friendlier, more efficient one. What's wrong with that? The problem is that if government is to remain a monopoly it is likely to continue to behave as one. This is the incentive problem of economics. The commitment to change, new ideas and cost effectiveness of our earnest city manager aside, what incentive does an organization providing services have to act in an entrepreneurial, consumer-oriented way when it ultimately will rob its "customers" to provide them their services whether they like the way those services are provided or not? Surely it possibly could behave differently, but why would it? Don't get me wrong. Private businesses can treat their customers like crap, and often do. They can charge high prices (relative to their actual costs), they can deliver terrible, clueless and even careless customer service and they can deliver low quality services and products. But in the marketplace, such negligence is an invitation to other entrepreneurs to enter into competition with the accused in what could prove to be mortal combat for the enterprises so engaged. Neglect the consumer and in time he may come to neglect you, as well as your profitability. It's simply not so with government. If the government screws up and treats taxpayers and citizens -- they're not necessarily one and the same, you know -- with indifference or even callous disregard, the agents of the government are still going to collect their paychecks and their velvet-lined pensions. Everyone would prefer a friendlier government than a meaner one, and it's possible some people who work for the government have, do and will strive hard to be decent, but the general tendency to do so isn't there because government is a monopoly and monopolies lacks the consumer-driven discipline of the market. Monopoly is just one problem. Back to the presentation for a moment. As the aggravated din of the crowd died down, the city manager attempted to carry on with his slide show. "Excuse me!" I piped up. "I had two questions." The crowd grew noisier again. I had just introduced a major theoretical obstacle, confounding the city manager's entire intellectual framework, but no matter. The participants couldn't be bothered, it seemed, with whether what they were hearing made any sense or not. They just wanted to get on and get to the end of it. "You have discussed throughout your presentation your efforts in cutting the costs of government services," I continued over the audible disturbances. "What you have not explained is how cost-cutting alone is a relevant metric for success in serving the citizens. Government operates on the welfare principle, while private businesses operate on the profit principle. How do you manage to calculate?" Frustrated, the city manager sought to make a tangential point. "Some services, like provision of a police force, just wouldn't make sense if you had to wait until the guy had you by the throat to make the call for help. In fact, they tried that recently in Kentucky with that guy whose house ended up burning down. Of course, anyone will say after the fact 'I would've paid, I would've paid!' but the point is, it's just impractical to have a bunch of police sitting around all day waiting for someone to call on them and then pay," he said. "That isn't true at all," I responded. "Private businesses manage this exact feat every single day. Think about an auto mechanic shop. They manage to make money with a business model that relies upon waiting for their customers to show up, ready to fix their cars. Anyway, that isn't the point. I want to know how you plan to calculate what is the best use of city resources in any given situation? I want to know how you calculate what services are 'necessary' and which are 'luxuries' that might be cut?" The audience had returned to a dismayed hubbub. Who was this nefarious ingrate in their midst? The city manager blew me off. "Let me just get through the rest of my slides and I think you'll be pretty impressed with some of our cost-cutting successes so far." It probably does not need to be mentioned that I was not impressed. In short, the city manager is hopelessly lost. His actions are not guided by the entrepreneurial motive (profit and loss) which is in turn guided ultimately by the action of consumers on the market. There is no profit and loss guide for government. Government monopoly explicitly rejects such a principle. Instead, his actions are guided by his subjective interpretation of his idea of what the citizens he is responsible for "need". As for how he will fulfill those perceived needs, the city manager is equally blind. For example, does he do the job in house or outsource it to a private contractor? Should garbage be picked up once a week or once a day? Does "waste removal" necessarily entail recycling as well, or just the transportation of trash? When the city manager has to choose between cutting costs and cutting services, how does he know which is the better one to do? "It's not a monopoly! They can move!" a woman beside me said in the midst of the cacophony that arrived following my first question to the city manager. "Sure it is," I replied, "He just said that people will not have the choice to reject paying taxes to support it." "What's your alternative?" she asked after the city manager had finished his presentation. "My alternative is the abandonment of government, in its entirety. Don't try to run government like a business. Instead, there should be nothing but businesses," I replied. "Have businesses provide city services? That seems beside the point," she declared somewhat haughtily. "The discussion is about how to manage those services, not how to provide them." "That isn't correct," I tried to explain. "I've just raised the point that the provision of those services by government is impossible. If it's impossible for government to provide the services it's certainly beside the point to discuss how government should try to manage to do so." "What's your bottom line? And hurry, I've only got two seconds," she shot back. I rolled my eyes at this rude and arbitrarily-imposed deadline. What, was I being interviewed on cable news all of a sudden or something? I took one second pondering how to phrase my primary idea and another second verbalizing it. "How will he calculate?" I said. She scribbled it on a piece of notepaper and proceeded to ignore me. "Now that I've had a chance to calm down a little, I just want to say, don't stop asking tough questions like you did," the woman advised. "Even though it might make people uncomfortable, we need outliers like you to challenge our beliefs." I didn't need the pep talk as I hadn't managed to find myself in a pit of nihilistic self-doubt following the poor reception of my questioning by the supposedly pro-market audience. If I was an "outlier" by understanding sound economic theory while they didn't, that was everybody else's problem, not mine. Still, I hoped I could leave this person with something to ponder besides the confused, self-contradictory babbling of Yet Another Starry-Eyed Central Planner. I turned to the woman and said, "Think about the example the city manager mentioned about the implementation of the self-checkout technology at the city library. The city manager said this was a successful demonstration of their 'competitive' principles because it lowered the cost of checking out at the library while other libraries nearby still rely on costly personnel to handle this part of the library process. Ignore for a moment whether the city manager is being honest or correct in determining this to be lower-cost on net. We'll assume he has achieved some financial savings. The question remains, is this the best possible way to serve the visitors at the library? Maybe it is lower cost, but what if library visitors prefer to receive assistance from a real person, for instance? There is obviously more to calculating the success of any of the city manager's proposals than simply examining the cost. After all, the absolute lowest cost process would be to not have any checkout system at all-- no machines, no people. That costs zero. You could instantly make the entire government permanently 'cost effective' by eliminating all spending entirely. But would that leave people feeling better off? Because he doesn't serve a voluntary market but rather taxes his 'customers' beforehand and then provides them with his anticipation of services that meet their assumed needs, the city manager will never know." The woman got up to leave, but before doing so turned to me and said, "You've certainly raised an interesting problem." No doubt, I had. Consequently, it is the problem of all socialist schemes and of course the one the city manager was least eager to consider or address. In conclusion, "competitive government" rests upon a farcical interpretation of what drives private businesses and how entrepreneurs ultimately manage to serve their customers. In a true market, entrepreneurs try to serve the customer's desires in the most efficient way possible by giving the customer that which he demands at the lowest cost possible. "Competitive government", on the other hand, gets it about half-right by trying to cut costs and provide goods and services as cheaply as possible. Whether those goods and services provided are actually demanded by anyone is another concern entirely, one which "competitive government" practitioners necessarily must ignore lest they reason themselves out of a job. Additionally, in accepting a monopoly role for government, "competitive government" supporters fail to ask themselves what type of incentive structure a monopoly faces in determining how to treat the consumers that it serves. "Competitive government" theorists ignore the historical expression of this perverse incentive structure and choose to believe that all the past problems of government are due to the wrong people running it, or the adoption of a misdirected focus or poor attitude. The solution to all the problems faced by government, as well as caused by government, is the spread of real, free market conditions as the predominating social institution and the concomitant retreat of governments. In short, the solution is the replacement of "substantially competitive" feel-good efficient-socialism rhetoric (however government agents themselves subjectively choose to define this) with actually competitive, private, voluntary free enterprise reality. Government is violence. Political parties are mafia gangs. When they duke it out like this you're getting a glimpse of how government truly operates, without all the "sirs" and "madams" and "I yield 5 minutes of my time" and the euphemisms about collecting "taxes" (aka armed robbery). If only this kind of stuff happened more often. It is, of course, totally disgraceful. More people might be wise to just how disgraceful government is if this kind of thing were more common. Here's hoping John Boehner's first act as Speaker of the House is to deliver a physical Boehner Beatdown to his fellow members of CONgress. On Sunday, November 28th, 2010, the New York Times as well as a number of other major news media outlets agreed to release the contents of 250,000 US diplomatic cables made available to them by the WikiLeaks organization. The New York Times will be releasing their analysis of these cables in parts over time. Before doing so, they issued a "Note to Readers" regarding their decision to publish and write about some of the diplomatic documents. It would be instructive to examine the reasoning contained therein to get a better understanding of the role of the members of the "free press" in a country like America, actual as well as the way these members perceive themselves, as well as to gain some insight into an institution like the New York Times' effort to maintain objectivity in their news coverage and analysis. The results may be startling for the deluded who strongly believe that groups like the New York Times are members of an objective, unencumbered and free press. The Times has taken care to exclude, in its articles and in supplementary material, in print and online, information that would endanger confidential informants or compromise national security. The Times’s redactions were shared with other news organizations and communicated to WikiLeaks, in the hope that they would similarly edit the documents they planned to post online. It is clear from this first paragraph that the employees of the NYT see for themselves a special role and responsibility within society. It is not my intent, at least at the moment, to question this perception but rather to elaborate on it. The NYT was granted access to an unredacted collection of the cables. In so doing, they were one of the first groups outside of the original government creators and users of these documents to have a completely unfiltered view of them. Now that they have had access, they have made some of their own redactions and have shared the redactions with other news organizations (as well as WikiLeaks) in hopes that they might be sensitive to disclosing anything with might "endanger confidential informants or compromise national security." To be employed by the NYT, so far as I know, one does not need to go through any government security clearances or government background checks similar to what one might have to go through if one were to be employed by the US diplomatic corps or other high-level government bureaucracies. As it stands, NYT employees are no "better", more loyal, honest or of necessarily sounder judgment about any issue or topic, than anyone else outside the government (note-- I am not implying the government's employees are, I am making a comparison only amongst non-governmental employees for a reason). Nonetheless, they have arrogated for themselves such a "gatekeeper" role as if they do naturally posses more loyalty, honesty, sounder judgment, etc., simply by virtue of the fact that they are members of the media. Furthermore, their judgment of what constitutes information that might "endanger confidential informants or compromise national security" is based off of... their judgment. They are implicitly asking for a lot of trust and authority in this situation. They are expecting their readers and the general public to assume that, without having the ability to consider such items of information for themselves, they can trust that the employees of the NYT would come to the same conclusions as they would about which items constitute imminent dangers to confidential informants and/or national security. Finally, the term "national security" is by itself an arbitrary and nonsensical concept. A nation does not exist. Individuals exist. A nation is a figure of speech used to refer to a social aggregate composed of particular individuals within a particular set of boundaries, laboring under a particular political system and sharing a particular set of other arbitrarily defined commonalities such as language, culture, ethnic background, ideals, etc. Individuals have interests and subjective perceptions of what constitutes a threat or a protection of their personal security. There is no such thing as a one-size-fits-all "national security" which represents every individual within a "nation". Therefore, the NYT's concern with protecting and censoring any information which could harm "national security" is again another way of saying they have complete, arbitrary power to use their own judgment in disclosing information or not disclosing information according to their subjective interpretation of how this might harm whatever they presume to be the interests of "national security". After its own redactions, The Times sent Obama administration officials the cables it planned to post and invited them to challenge publication of any information that, in the official view, would harm the national interest. After reviewing the cables, the officials — while making clear they condemn the publication of secret material — suggested additional redactions. The Times agreed to some, but not all. The Times is forwarding the administration’s concerns to other news organizations and, at the suggestion of the State Department, to WikiLeaks itself. In the interests of not being repetitive, I will not labor to explain in full detail why the idea of a "national interest" is a flawed one. Please review the paragraphs above on "national security" for a comparable analysis. This next disclosure from the NYT is again worthy of comment and I want to again stress that my interest is simply in drawing obvious conclusions from a set of observations, not to offer any specific judgment at this time about whether those conclusions represent "good" or "bad" things. The idea of a "free" and "objective" press connotes the following ideas: that the press is able to offer an objective view of the simple facts of news events (what people said, what people did, when the events took place, what events transpired leading up to these events which may have been related, where the events took place) without coloring or distorting the reportage with subjective opinions and/or biases; that the press is able to make these observations and comment on events without feeling any pressure or compulsion from third parties to present the news in a particular way (aka "stylizing the facts" or "spinning the news"); that the press is a watchful, skeptical and if necessary, antagonistic surveyor of those it covers, especially the political system and its participants, in the interests of providing the public with the information they need to make sound judgments about their government and its doing; that the press does not engage in censorship or self-censorship in order to appease pressure groups and political agents, outside of specific, limited circumstances whereby a particular individual may suffer physical or intense emotional harm if various details are disclosed (for example, when the press covers crimes involving a minor, sexual crimes or the claims of whistle-blowers who may be retaliated against if their identity is made known). For good or for bad, neither the NYT nor any other media group may consider itself a member of the objective, free press when it not only censors its coverage in the name of protecting "national security" and "national interests", but also offers its planned reportage to political officials for review and final approval. it may not consider itself a member of the objective, free press when the NYT adopts further redactions and censorship requested by those political officials at the conclusion of the review when those redactions and censorship did not seem appropriate to the NYT according to its own "independent" judgment before it was offered for review. For good or for bad, this paragraph conclusively demonstrates that the NYT has thrown its lot in with the US government. The NYT clearly sees for itself a need to be "patriotic". It is not an "independent news agency"; it is an "American news agency" along with all that entails in contrast to the idea of an independent, allegiance-less news agency. This policy, as stated, opens up a can of worms, again, for good or for bad. There are all kinds of potential decisions the NYT might make about disclosing or not disclosing information according to this policy which many might find controversial: the NYT may neglect to disclose instances of torture by US agents for fear that this intelligence could be a useful recruiting tool for designated adversaries of the US; the NYT may neglect to disclose knowledge of intelligence operations which involve direct violations of the law or involve other unscrupulous or immoral activities because doing so might undermine the US governments ability to develop intelligence on "hostile countries"; the NYT might neglect to expose known weaknesses or defects in American weapons capabilities which put the lives of American military personnel at risk, or pose potential harm to innocents who may be exposed to such weapons and their defects, because the NYT is concerned about protecting such information from those deemed by the US government to be its enemies. In adopting such a policy, the NYT is putting itself in the position of playing god and potentially weighing human lives against one another. The NYT is putting itself into a position where it will have to make a decision concerning the "balance" of what might potentially be lost in terms of individual lives or wealth versus what might potentially be gained for US political interests in protecting some of its knowledge. Additionally, in adopting such a policy the NYT, by implication, accepts the characterization of US political interests of its adversaries and accepts their judgments of such threats as sound. In other words, the NYT puts itself in a position whereby it loses its ability to independently judge for itself whether the classification of various individuals and entities as "enemies" by US government officials is justified and instead adopts these judgments as its own in making considerations about what information can be disclosed or must be redacted and kept from the public. The potential for abuse is, again, obvious. Should resistance be merited in any given situation, it will be difficult if not impossible to generate such resistance when primary producers of news information such as the NYT have become essentially PR tools for disseminating the viewpoint and perspective of political interests as if these are objective facts without dispute. As daunting as it is to publish such material over official objections, it would be presumptuous to conclude that Americans have no right to know what is being done in their name. For a truly free and objective press, this task should prove no more daunting than it would be for any other normal, independent individual to overcome the objections of any government officials on any topic whatsoever. The fact the NYT views this responsibility as "daunting" is, again, telling. Part of the NYT's business model relies upon receiving its own special, high-profile "leaks" from government officials and political interests, along with its normal, everyday public access to less secret or mysterious sources. In seeking to protect its business model, the NYT must often choose between offending a potential source and losing the ability to be the recipient of success "access patronage" in the future, or to protect the interests of the source by agreeing to not make disclosures or engage in coverage that the source deems to be harmful to it. In these situations, the NYT is making determinations about what best serves it, not what best serves "the public". The NYT may feel torn about possibly affronting some of its sources in choosing whether or not to disclose information related to the diplomatic cable leaks. But for it to not even think twice about "redacting" this obvious bit of self-interest in making its policy explanation to its readers is at best a glaring oversight and at worst an outright act of fraud and deception. The following is Part V in a seven part series, "A Refutation of Mosler Economics and Mosler's 7DIF", which seeks to critically examine the fiscal and monetary policy solutions offered by Warren Mosler [PDF], a former candidate for the US Senate in Connecticut in the 2010 election. that takes away jobs and output. As it stands on its face, there is nothing I disagree with here. Let's dig deeper and see if there is anything controversial. A trade deficit, in fact, increases our real standard of living. all have the trade issue completely backwards. Sad but true. Mosler is right to assert that there is nothing controversial or problematic about receiving something for nothing. This is, in fact, the economic objective of all individuals who routinely try to pay as little as they can for whatever it is they determine they might need. Of course, government is the only actor in the economy (aside from petty private thieves) which ever manages to achieve such an arrangement, something for nothing, on a routine basis. Government simply steals from one person and then grants the property to another. It gives no compensation to its original victims. And this is the central issue with Mosler's point interpreted more technically. He makes his arguments and assertions in terms of collective entities and aggregate accounting identities but he does so erroneously. The reality is that "Japan" doesn't send "us" 2 million cars a year. Instead, a Japanese company, such as Toyota, sends individual cars to individual buyers in America. Because the Bank of Japan acts as a settlement house for foreign currency exchange, Toyota's dollar revenue ultimately gets remitted to the Bank of Japan, in return for yen, which Toyota then uses to pay its employees and suppliers who in turn utilize their local currency to secure real goods and services for themselves. The Bank of Japan remits the dollars to the Fed and chooses to keep those balances in US treasuries as savings. It would be inaccurate to say that the car company Toyota gives cars away to Americans in a quest to accumulate growing US treasury balances, that is to say, that Toyota trades cars for "paper" or nothing. Toyota trades cars to Americans in hopes of acquiring currency which it can eventually exchange for real resources (either in its own country, with yen, or in America or other countries, with their respective local currencies). The Bank of Japan, then, trades nothing for nothing (yen for dollars, dollars for US treasuries). Meanwhile, Japanese individuals and firms decidedly do trade something for something. Mosler is correct to state that the "trade deficit" is merely the result of accounting identities related to these transactions. However, he is not correct to imply that aggregate, social entities are trading with one another, such as "China sends X to the US in return for nothing." services in return, why should we not be able to take them? Again, Mosler is only able to make such an assertion by examining the collective accounting identities of "aggregate" economic activity. When you dig a little deeper to the individual exchanges being made in reality, there are qualitative differences between the various exchanges and these differences are important. The Chinese government, by manipulating their currency via their dollar peg, is assisting the US government in financing its deficit spending (that is, debt-driven spending). In other words, in terms of real resources, along with the exchanges of private individuals in China and the US making exchanges of real wealth for real wealth, there are some exchanges being made which result in the US government acquiring real wealth in return for promises to pay back the lenders of that real wealth in the future, ostensibly with real wealth. Realize this is necessarily the intent of someone, somewhere along the line because in the absence of coercion, no one would exchange a material something for material nothing unless as an act of charity. As discussed in previous installments, government expenditure is consumptive, not productive. All government can accomplish by its spending is to redistribute resources from those who would control it following voluntary exchange, to those it has decided to favor by bestowing them with its largess. Anyone who contests this principle is invited to review the following: Government Produces Nothing, Ever. I won't spend time further defending this principle as I have already elaborated on the fact that it logically follows from an understanding that a.) value is subjective, b.) all voluntary exchanges are wealth-enhancing or else they wouldn't be made and all involuntary exchanges are redistributive of existing wealth, at best, which is why they require force to occur. Because the government is in the business of redistributing wealth via involuntary exchanges (taxation), the government's expenditures can not result in a net economic benefit to society in comparison to the arrangements which would've occurred voluntarily on a free market. Therefore, it is alarming if government debt is growing and it is alarming if the government manages to find a way to fool more and more individuals, through the complicated machinery of the economic and global financial systems, into giving it more and more real resources in exchange for promises to pay back that it has no ability to fruitfully do so without first stealing from someone else. It is wonderful if people really did want to send real resources to individuals in the US with no intent of being given any real resources in return. It is not desirable if the recipient of such charity happens to be the government. That increases the chances that such wealth will ultimately be squandered, to be of no material, productive benefit to future generations. If Mosler disagrees and believes that government expenditure is equivalent to private expenditure in quality, or that it may even be superior to it in terms of economic benefits, he is again operating off an economic theory whose principles he does not clearly state, in order that his readers might be able to judge the validity of those claims for themselves. capital?” There isn’t any! The entire notion that the U.S.
is somehow dependent on foreign capital is inapplicable. Mosler is continuing a discussion based upon an example whereby a US individual purchases a Chinese car via a loan created by a US bank. It is interesting and perhaps instructive that Mosler does not examine the dynamics of such a transaction involving a cash payment by the US individual, rather than a credit-based transaction requiring the creation of a new loan. One wonders why Mosler fails to examine the implications of such a potentiality. options do foreign savers have for their dollar deposits? Where does the capital come from, then? According to Mosler, it is simply summoned into existence via bank credit-creation and spreadsheets. This confusion will be treated more concretely in Part VI, which deals directly with the role of savings in investment. The following is Part IV in a seven part series, "A Refutation of Mosler Economics and Mosler's 7DIF", which seeks to critically examine the fiscal and monetary policy solutions offered by Warren Mosler [PDF], a former candidate for the US Senate in Connecticut in the 2010 election. Here's how he fleshes it out a bit. numbers in our bank accounts. This includes Social Security. than record-keeping, as are all accounts at the Fed. that are changed up as payments to beneficiaries are made. So far, just an "operational" description of the mechanics of government accounting. Nothing controversial. Mosler explains the "functional similarity" between Social Security and buying government bonds. dollars now and you get dollars back later plus any interest. A technicality to take note of-- whereas in his previous discussions of the market for government debt Mosler manages to twist out an explanation that such exchanges are "voluntary" because the buyers and sellers of government debt are not being forced to make these exchanges, this condition no longer holds true when considering Social Security. This is an exchange which is entirely involuntary. Individuals are forced to contribute to Social Security via payroll taxes. The "function" might be the same (government takes money now and gives money back later) but the motivation for such an exchange is different (force, versus voluntary decision-making). have sufficient funds to buy what they need. them? How much housing? Clothing? Electricity? Gasoline? seniors more of those goods and services means less for us. more than numbers in bank accounts. most valuable for that purpose. This is another example of Mosler relying on an unstated economic theory, whose premise is that higher spending on education by government necessarily translates into higher future productivity and therefore a more prosperous economic future for everybody compared to what it otherwise might be. He presents his conclusions based off of this unstated economic theory as if they are obvious simply from observing the problems of resource allocation related to Social Security, without notifying his readers that he is in fact employing a particular theory which is not offered for consideration and scrutiny. As Mosler correctly identifies, the "problem" of Social Security is the allocation of scarce resources and the future production thereof, and this problem can not be solved by the issuance of new money (even though this seems hypocritical because in some of Mosler's other proposals he insists that the issuance of new money can be a catalyst to drive individuals to produce more than they otherwise would). However, he is wrong to assume that inadequate government spending on education now is the root problem of future scarcity. 2.) The government, once committed to a decision to spend a particular amount on a particular type of education, has no way to calculate if the results of its decision were successful, ie, resulted in a net benefit (benefits accrued greater than costs incurred). The government does not operate according to entrepreneurial profit and loss and it has no DIRECT market prices to rely upon for any of its decision-making. For example, the government may choose to pay a teacher $40,000 per year, and it may come to this decision by trying to examine the pay for "comparable" work (say, an accountant's annual salary, or a store manager's annual salary, which, for whatever reason, the government may determine to be "comparable"). But this doesn't represent an actual, market price for what a teacher's labor is "worth" annually because it was not a price arrived at through the voluntary buying and selling of the market. It doesn't represent any meaningful price signal about actual economic scarcity related to private supply and demand. Furthermore, the government has no way to judge if it generates a "return" of greater than or equal to $40,000 worth of benefits from the expenditure on the teacher's salary. The government may try to simulate a "social return" statistic by looking at rates of graduation, rates of college attendance, rates of crime, rates of poverty, rates of health and wellness or rates of business creation or even economic expansion, etc., but none of these things represent a monetary rate of return that can be used for economic comparison via a common denominator. All the government can do is guess. They just have to have faith in the righteousness of their own decision-making. Mosler has to do the same. This is not an economic theory but a political theory and it rests not on any economic truth but on the force of the opinion of Warren Mosler and anyone else who advocates such measures. It's an opinion masquerading as a fact. It's a fraud. The following is Part III in a seven part series, "A Refutation of Mosler Economics and Mosler's 7DIF", which seeks to critically examine the fiscal and monetary policy solutions offered by Warren Mosler [PDF], a former candidate for the US Senate in Connecticut in the 2010 election. Let's see how Mosler fleshes this out. residents - what is called the “non government” sector. savings” for the rest of us, to the penny. penny). This is an accounting fact, not theory or philosophy. authority. They are just plain wrong. True: this is a financial accounting identity. False: the belief (whether Mosler holds it or not) that increased financial savings necessarily represent increased real savings. So far, Mosler has not stated whether he equates financial savings with real savings. Regardless, I will clarify that anyone who would state such a thing as "an increase in financial savings necessarily means an increase in real savings" would be wrong. If the US government expands its budget deficit and thereby expands the total amount of financial savings as a result (because all debt is held by somebody outside of the government sector as savings, as per Mosler's statement of the accounting identity), it does not follow that the pool of real savings (anything which may serve as a capital good in the production of higher order goods, for example, machinery, food stocks, clothing stocks, commodity stockpiles, fuel supplies, etc.) is increased proportionally, as an identity. In other words, it would be wrong to assume that, because larger government deficits represent larger financial savings, larger financial savings represent larger real savings and therefore larger government deficits mean larger real savings which means we are all wealthier and economically better off if the government expands its deficit. he is better off buying them than not buying them. No one is ever forced to buy government securities. It is important to point out a clarification regarding Mosler's note that these purchases are "voluntary." They are "voluntary" within the conditions predicated by a government which has enacted legal tender laws (threat to use force against anyone who does not settle debts in the legal tender) and which guarantees its own ability to make good on its debts by its ability to ultimately tax individuals either directly or indirectly (through issuance of new money) to raise the funds needed. Of course, none of this can at all be considered "voluntary" because it rests on government's monopoly of the use of coercion. The government does not make productive expenditures which return to the government its original cost plus profit (which can be used to pay principal and interest), unlike the productive expenditures of private investment. Government expenditure is consumptive-- once the government spends, it receives nothing in return. The wealth is gone. If the government finances its expenditures through debt, it must steal (tax) at some other time to raise the funds necessary to pay off the debt. Without it's ability to steal (tax) the funds it needs to pay off its debt, the government would be left with nothing to pay off its debt. No one would voluntarily lend to the government who was at all concerned with getting a return on their loan because they'd realize the government would not have the ability to make good on that debt. The only people left financing the government's expenditures would be those who found it to be a charitable activity to do so. It is within this context of coercion and manipulation of people's opportunities to dispose of what remains of their wealth as they see fit that Mosler states that people "voluntarily" buy government debt. Yes, no one is ever forced to buy government securities, but some people are forced to provide the government with the resources it needs to pay off these securities at time of maturity. Mosler describes a conversation with Al Gore. boom into the soon-to-come bust. aggregate demand needed to restore output and employment. over that period of time. remains far too small for the circumstances. Mosler again is employing an unstated economic theory that he is using to interpret the events of the 2000s to reach a conclusion about the cause of the recession. He claims that the deficit was "too small". It is unclear if he means to imply this was the cause of the "sub-prime debt-driven bubble" bursting or if he means to state that this was a contributing factor to the recession that followed, along with the government deficit which was "too small." Mosler does not state how he calculates whether the deficit is "too small" before a recession occurs. It is "clear" to him in retrospect that if a recession occurs, it means the deficit was not large enough. But if this is true after the fact it must also necessarily be true before the fact and therefore there must be some theory or pattern of reasoning one could use to predict that the deficit is not "big enough" to meet the needs of the economy. Individuals can save in vehicles other than government securities. If the government does not run a deficit and thereby expand the supply of government securities which people can place their savings into, individuals can choose to either spend their wealth on personal consumption or private savings/investments, such as bank deposits or the purchase of corporate debts. Mosler doesn't explain why savings held with the government (Treasuries purchased by the non-government sector) serve to ward off recessions, but savings held with private businesses lead to recessions. small a deficit that might be. (which is still very relevant today). Governments have to intervene; the economy is not self-regulating. The principal economic objective of the state should be to ensure a prosperous economy. Money is a creature of the state; it has to be managed. Fiscal policy should be directed in the light of its impact on the economy, and the budget should be managed accordingly, that is, 'balance' is not important in itself. The amount and pace of government spending should be set in the light of the desired level of activity, and taxes should be levied for their economic impact, rather than to raise revenue. Principles of 'sound finance' apply to individuals. They make sense for households and businesses, but do not apply to the governments of sovereign states, capable of issuing money. Mosler states that "functional finance" is "still very relevant today." This appears to be approval of functional finance and therefore the principles of functional finance. We therefore have some insight into the economic theory Mosler is utilizing to reach his ultimate conclusions about how monetary policy should be employed to benefit the economy. It would appear safe to say that Mosler does not understand the functioning of markets and that he is an advocate of Keynesian economics (Lerner is cited as the inspiration for the use of monetary and fiscal policy as the two tools of Keynesian economics) as the principles of functional finance are similar/in many cases the same as Keynesian economics. Therefore, all criticisms and debunkings of Keynesian economic theory will likely similarly apply to Mosler economics. In attacking some of the premises and claims of Keynesian economics, the foundation of Mosler economics is similarly eroded. Many authors have spent much time and effort debunking these claims independently. Here is one such effort on The Myth of Functional Finance. If you are interested in those efforts I suggest you search for them, principle by principle, on your own. I won't waste time by repeating them all here. Rather I will try, in the future as I have so far up to this point, to address these principles when Mosler seems to be inferring them or relying upon them in his analysis, even when he does not openly state that that is what he is doing.